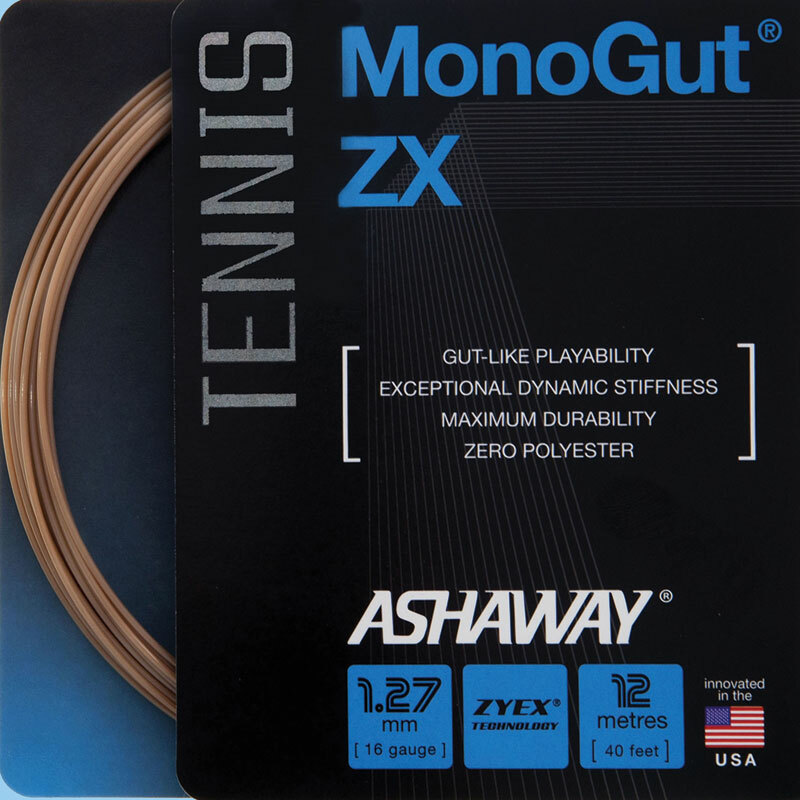 Ashaway, RI — In moves to capitalize on its established brand and provide added recognition in the marketplace, Ashaway Racket Strings has renamed the recently introduced Zyex® MonoGut tennis string as MonoGut® ZX. The early version of the string has gained increasing popularity for its exceptional dynamic stiffness and gut-like playability, leading many playtesters to predict that the long sought goal of producing a synthetic string to rival the performance of natural gut has been reached. In addition to its resilience, the newly dubbed 1.27 mm MonoGut ZX has been collecting kudos for its improved abrasion resistance, and a surface design that minimizes string movement for better ball control. MonoGut ZX is designed for players seeking both gut-like playability and superior durability in a solid monofilament string, as well as players using monofilament strings in hybrid stringing patterns. A natural gut-like tan in appearance, MonoGut ZX is available in 40-ft (12 m) sets and in both 360-ft (110 m) and 720-ft (220 m) reels. Recommended stringing tension is up to 60 lbs. (27 kgs).